On July 23, 1870, a Swedish Colony was established by the State of Maine in the virgin forest of Aroostook County. Maine had appointed William Widgery Thomas, Jr. (who had served as Lincoln's Civil War Consul in Sweden) as State Immigration Commissioner. He went to Sweden, recruited the first 51 immigrants, and led them into the township that became New Sweden. 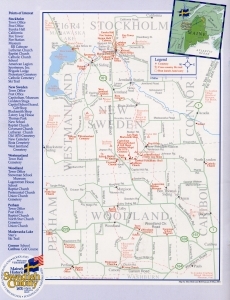 Early hardships were overcome and the Colony prospered and grew into the neighboring townships of Westmanland (1879, Stockholm (1881) and the surrounding areas. 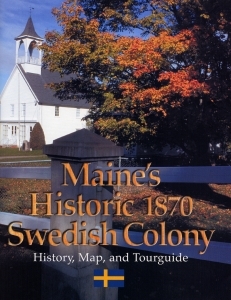 MAINE'S SWEDISH COLONY has prepared this booklet to provide you with both an historical perspective on the Colony area, and a map-oriented tour guide to historical and current points of interest. After a brief introduction as to how the Colony came to be, the contents are organized by townships involved: New Sweden, Stockholm, Woodland (and Perham, Connor, Caribou) Westmanland and Madawaska Lake (T16R4). For each, there is an early history followed by what exists today. The booklet also contains many old (nostalgic) and new photographs. See the Service and Cultural Directory insert for current list of local contacts, places to see, and other information. The front and back covers are shown below. THE EVANGELICAL COVENANT CHURCH developed from a nucleus of 20 members who joined together November 27,1886. Rev. O.P. Fogelin became the first pastor. On September 22, 1891 the members met in a partially completed church, which was then incorporated as the Free-Christian Gospel Mission Church of New Sweden. The church building was dedicated December 6, 1891. 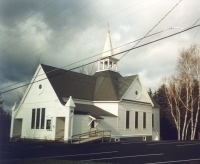 In 1897, the church joined the Aroostook Conference of Congregational Churches. In the 1940's, it became affiliated with the Eastern Missionary Association and then with the Evangelical Covenant Church of America. THE GUSTAF ADOLPH EVANGELICAL LUTHERAN CHURCH was organized August 1871, by 221 men, women and children under the leadership of Pastor Andrew Wiren as the First Swedish Evangelical Lutheran Church of New Sweden, Maine. The name was changed in July, 1896. Church, Sunday School, and regular school activities were conducted in the public building, Capitolium for many years under the Supervision of Pastor Wiren. The original (and present) church building was dedicated July 23, 1880. It is now on the National Register of Historic Places. In July, 1901, it was decided to annually celebrate the day of the founding of the Colony, July 23, 1870. THE FIRST BAPTIST CHURCH of New Sweden was organized March 4, 1871, when 8 members met at the home of one of the original immigrants, Mr. Nels Olson, who became the first church leader. On August 27, 1892 the present church building was dedicated. Sunday School was started in Stockholm in 1897, and other Sunday Schools have been conducted in several areas over the years. In 1907 a chapel was built in Jemtland and in 1939 another chapel was built in the B & A section of town. THE LARSSON/OSTLUND TWO STORY LOG HOUSE was built (c1870's) by the Noak Larsson family, and was owned and occupied by the George Ostlund family 1910-1989. Maine's Swedish Colony, Inc. purchased the 40 acre property in 1989, and the exterior of the house, potato cellar and garage have been restored. Restoration work is continuing. The house is listed on the National Register of Historic places. THE LARS NOAK BLACKSMITH AND WOODWORKING SHOP was built by Lars Noak (the son of Noak Larsson) about 1900 on the hill known as Mt. Ararat. It is located across the road from the Log House. The Shop was operated until about 1940 and has been preserved in its original condition since then. Many demonstrations and "open house" functions are held during the summer months. This building is also listed on the National Register of Historic places. 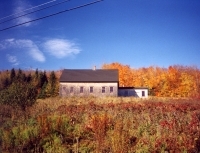 THE CAPITOL SCHOOL is the last of the one-room school houses built in various sections of New Sweden in the 1920's, and is the only one retaining its original character. After it ceased to operate as a school in 1950, it served as the town voting place and housed the local Grange. The school contains original blackboards, teacher's desk, text books and student desks from the same era. In 1994 a Scandinavian Gift Shop opened in this building to benefit the restoration and maintenance of the buildings being restored by Maine's Swedish Colony, Inc.
NEW SWEDEN HISTORICAL SOCIETY MUSEUM. A large public building, called "Capitolium" was built by the Swedish settlers on a public lot on Capitol Hill in the fall of 1870. It served as the immigrant reception center, school, supply store, church and town hall. When a new town hall was built, the Capitolium became a Museum. It burned in June 1971, and was rebuilt by 1974. All of the artifacts and the large front doors were saved from the fire and are a part of the new building today. THE LINDSTEN STUGA is a typical early immigrant log home. It was built in Westmanland as the original home of Karl and Kerstin Lindsten and their children, Annie and George. After a new frame home was built, the log cabin was used as a tool shed. In 1980 it was moved to its present location behind the New Sweden Museum and restored. It is furnished with many of the original family furnishings. Open house tours give visitors a view of the "way it was" in the early days. THOMAS PARK owes its background to the generosity of W.W. Thomas, Jr. who deeded the land to the town for the purpose of having a community social gathering place. Through the efforts of many town volunteers, park benches, a dining hall, and a band shell were added. THE UNITED STATES POST OFFICE first opened in Clase's Log Cabin, perhaps moved to the Museum bulding, then the Bernard Peason place. Around 1901 it was housed in Tornquist's general store. There was also a Post Office at "Nelson" on Andrew Nelson's farm on West Road for three years, 1905-1908. In 1914, the Capitol Post Office was consolidated with one in the re-located log Old Center School at New Sweden Station. The new and present Post Office building was opened January 11, 1970. THE NEW SWEDEN CEMETERY grounds were deeded to the town and the New Sweden Cemetery Association was formed in 1905. A formal dedication was held on July 27, 1909. The first cemetery, dedicated July 24, 1870, is located behind the Museum. A large granite monument marks that area. It is engraved with the names of the first early burials. Wednesdays thru Sundays (beginning on June 27) from 12 noon to 4 pm. Other hours or days may be arranged by phoning 207 896-3199 for special appointment or group visits.